I didn't mean to be a busybody, but there was no way I could have avoided overhearing this guy's side of the conversation. He was shouting it to the entire airport café. What he said was a paragon of corporate vagueness and evasion: "I know you and your team have a different view of the assets and the marketplace, and at the end of the day we're all going to sharpen our pencils and evaluate the outcomes to see how they match the projected scenarios. Let me be candid with you..."
So glad you caught the conversation that goes with the lively sketch! So emphatically and apparently sincerely spouting gobbledygoo. In my profession, I call it edu-babble (I'm a teacher.) And at the end of the day, let's all not forget to "sharpen our pencils,"
I see this was painted in 2007, before the financial meltdown. It's possible this guy lost his job. With his command of cliche and jargon, it's conceivable he found new work as a freelancer, ghost-writing Artist's Statements. 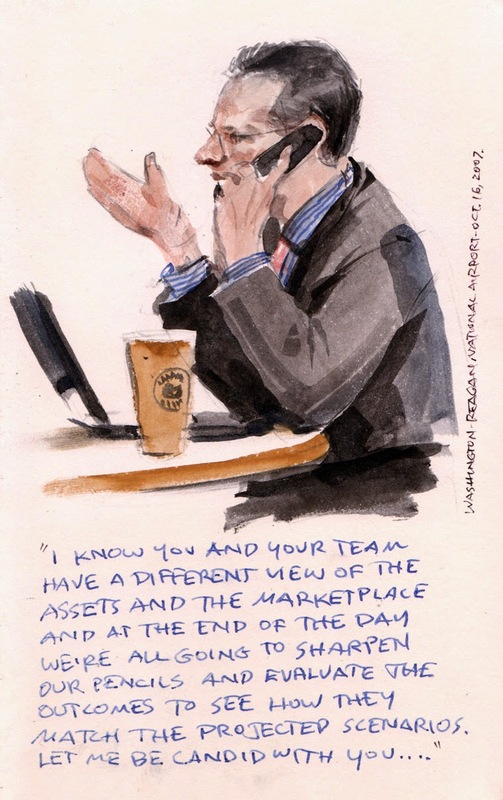 Great sketch, which complements the text (or vice-versa) perfectly. 'Let me be candid with you' actually translates as 'I'm now going to speak to you like you're 5 years old'. Great sketch. You can actually visualize him gesticulating into thin air. Yup that incident so reflects on how some people can be a real horse's pattootti! Btw, I can't stand those type of people who can't treat other people with as so much as an ounce of respect. A paragon indeed. That's exactly what I was thinking. And i'm increasingly confused by phrases like, "i'm going to be candid with you..." or "i'll be honest with you..." or "to tell you the truth..." Are they admitting that they were lying right up to that point? If so, why should i believe them now? And NEVER let cellphone conversations be allowed in flight!! These snippets of people are lovely and so relevant. Love the energy of the painting, especially the added text. Coming from the corporate world...ugh...buzzwords, cliches...so it goes. Great work sir!! !